Registration for the workshop and the conference is now open at the GIScience2014 web site (early bird until August 11th, 2014). Triangle of Sustainability show is a way to interact with large amounts of Linked Spatiotemporal Data to support understanding of the ecological, social and economical dimensions of sustainable development. The Triangle of Sustainability (in German “Dreieck der Nachhaltigkeit”) by Thomas Bartoscheck and Tomi Kauppinen from the Institute for Geoinformatics at the University of Münster was awarded with a Finalist Position and is competing for the first prize in Wissenschaft interaktiv 2012, June 2–6, 2012, Lübeck, Germany. The Triangle of Sustainability is an interactive show to explore observations about deforestation of rainforests and related phenomena such as road networks, political situation, and market prices of agricultural products on maps and timelines. The Triangle thus connects three important aspects–ecological, economical and social–of sustainability. By doing this the Triangle serves as a show of what is achievable by interconnecting different scientific assets via the Linked Science approach. The goal is to raise the awareness, and understanding of different factors of sustainability. The Triangle thus serves as an example of how the research field of Geoinformatics, and more generally Geographic Information Science can serve the society in these tasks. The resulting information can be explored on three screens (see the figure above). The interaction is made extremely simple yet powerful, no additional tools are required for the participants. All the spatial and temporal information can be zoomed and panned simply by making gestures using hands. The technological basis is built on the power of Linked Data techniques for interconnecting these very heterogenous data about different environmental and social phenomena. 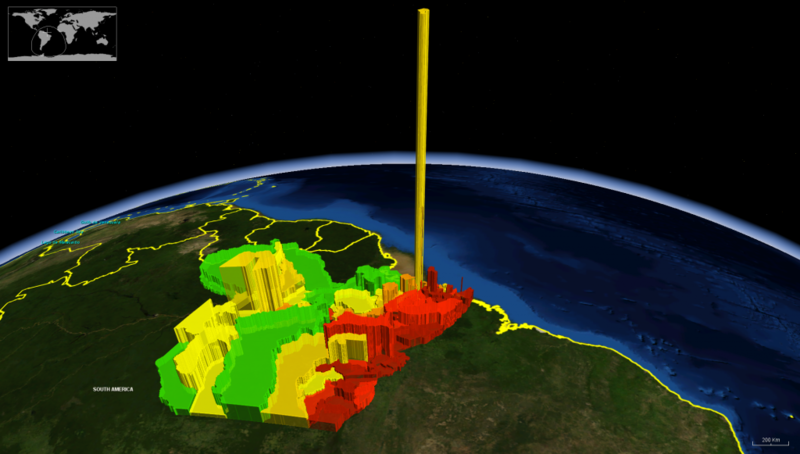 The data used by the show is the Linked Brazilian Amazon Rainforest published at LinkedScience.org.